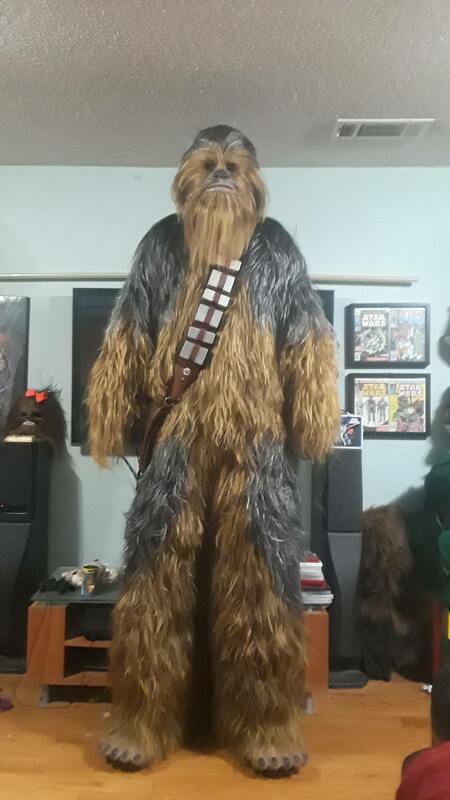 Posted: Tue Dec 18, 2018 5:01 am Post subject: New Chewie just finished!! This one took me a month and a half from start to finish. I made everything except the bandolier. My concern is that the bando looks a little short. What do you all think? Mel contacted me and offered to fix my strap, so Im good on the bando now. I'll add some length the the arms too. Thanks for the tip! As a builder myself, I would suggest a total strap replacement over a fix. Everything on it looks off honestly. the box spacing is way too tight. Adding length to the bottom of the strap will look just wrong. So make sure you work closely on the repair. I told her the other bandos I got from her in the past were longer and boxes were spaced farther apart, so Im sending the strap back and she will make a longer one instead. I didnt notice it until I tried it on and posted to Facebook. I thought about adding some length at first, but Mel saw my post and contacted me before I did anything. Wow ! a month and a half?? that is super fast...my budget build has taken over two years...hahaha...looks great...and yep the arms could be lengthened a bit as well as the suggested solution to the bando...great job overall. Mel is great people! Glad you're getting your strap sorted, brother! Was this your full time job!. It took me almost a year to do mine. If I could do it in 1.5 months I wouldn't hesitate to make another one. I worked on it every day after work and almost all day on my days off. Wow! I am still floored when I see builds being done that quickly. I may hit 2.5 months on mine if I finish by end of next week, but that is also with working on it almost daily and pulling quite a few all night latching sessions. Either I must be very slow or doing something wrong. But I did notice recently the mesh I was using is smaller hole than some others so that could be why. It's all good though, I got to catch up on some recorded TV show stuff and sing 80s music to myself till I hated it hahaha. Build looks good and I am working with Mel to hopefully to get a bando next week at the latest since I really am pushing for submission before end of next weekend on my solo build. I saw the post about your mesh. I use the Joanns Utility mesh and the holes are larger so it goes faster. I bought a mesh shirt off ebay once and it had a lot more smaller holes and took forever to finish. Nowadays, I just use the Joanns stuff. That is great that Mel is doing the Solo bando. I asked her about it several months back. 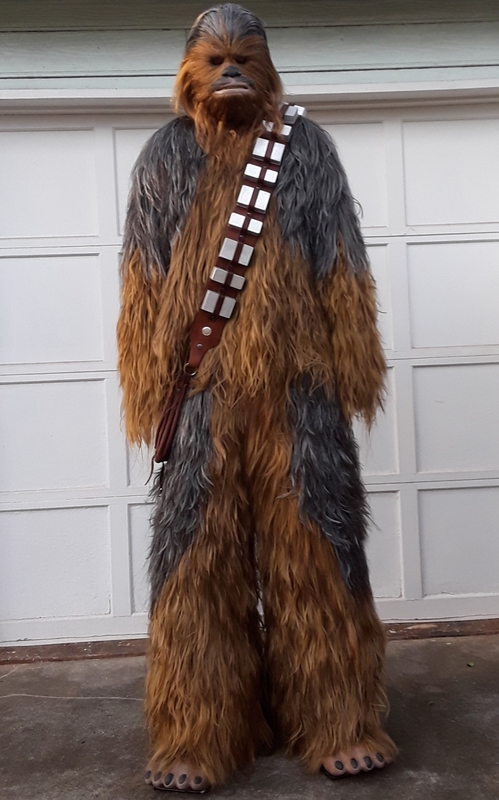 That might have to be my next Chewie. I love that suit. I'll be following your build. 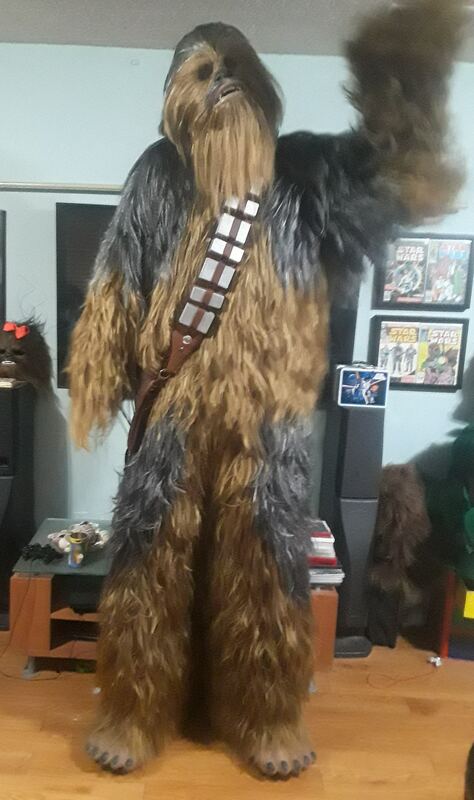 Got my new bando, attached longer hair to the sleeves, and curled up the beard on the mask. I just finished submitting my applicaton. Will do, I just need to update it. 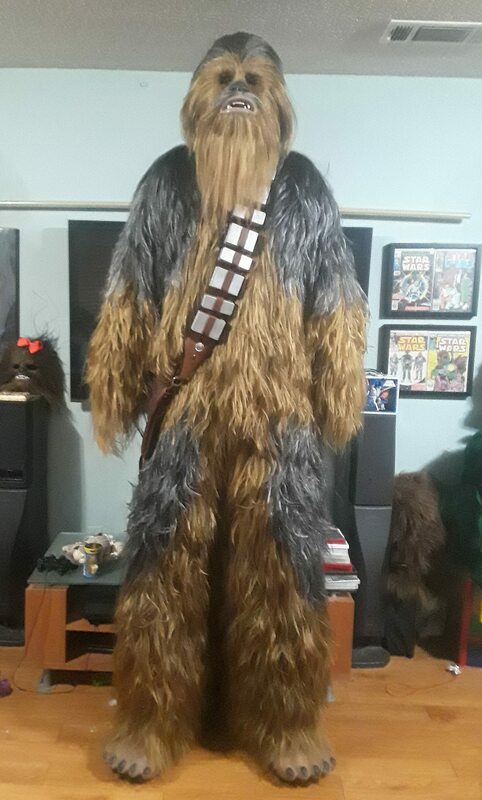 I have been working so hard to get this done I have not done a proper build log like I did my first wookiee. Also glad to know you are using a larger mesh hole. I was really starting to question my ability to latch hook. I mean, I know I am freaking old compared to many folks who do this, but I am not 1 foot in the grave old yet!! hahaha I have been latching every other hole, every other row on the small hole stuff, so that is why I am just now going to be finishing the shirt. The upper chest and upper back will be only areas not latched that closely. The tighter holes also make my suit look like a huge puff ball! I have to do something about that for sure before I submit. Got my new bando, attached longer hair to the sleeves, and curled up the beard on the mask. I just finished submitting my application. Wooohooo!! Best of Luck! I will be paying attention for any possible rework you may have so I can check mine compared to what you have.